Goalkeeper David de Gea considered leaving Manchester United because of the criticism he received following his £18m move from Atletico Madrid in 2011. The Spaniard was blamed for both goals in the 2011 Community Shield win over Manchester City, while errors against Basle and Benfica hastened United's Champions League exit that season. When asked if he ever thought about leaving, De Gea, 23, said: "Sometimes. "It's difficult when you get a lot of criticism. But I kept strong." 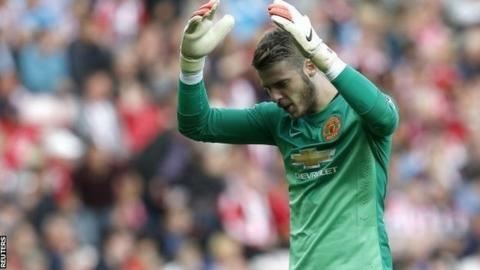 However, De Gea, who has now played more than 130 games for United, said overcoming the difficult period helped him improve as a keeper. "What happened at the start helped me be the player and man I am now," added the Spain international. "When you have bad moments you have to improve. You have to become stronger to deal with it and I believe I have become stronger. I am much better now."